“I’ll bring the soda if you’ll bring the Doritos.” He’d already been turned down for the sales job, but he knew he deserved a chance. He went back to talk to the VP of Sales and plead his case, to which he was essentially handed a list of names and numbers and told to “prove it.” Call it luck, call it good fortune, call it whatever you’d like, it just so happened on his first ever cold call, he was able to connect with the owner of the business and land a meeting. That was several years ago. 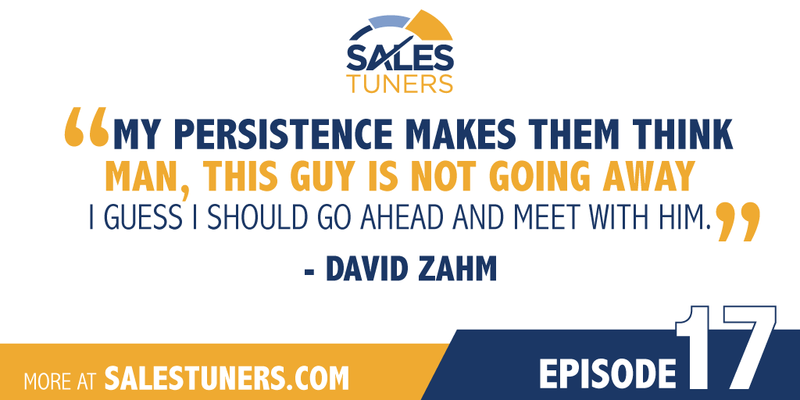 Today, David Zahm is an independent commercial lines insurance agent who has grown his book of business from $1M to more than $6M in just last two years? How on Earth is he having that kind of success in a what is essentially a commodity business these days? David told me he mails out more than 200 pieces of 3D mail, every single week, and then calls in behind those items to set meetings. Auto Ask – Figure out how to consistently get in front of your audience with a unique fresh message. Eventually they’ll either meet with you, tell you they’ll meet with you a later date, or tell you to go away, but the persistence will ultimately pay off once they see your commitment. Don’t Reinvent the Wheel – Look around you. Talk to other reps in a similar role. Talk to your competitors or at least reps that sell into the same type of prospect profile you. What is working for them or what has worked for others? DIY Before Outsourcing – Unless you know the intricate details of a process, it may not be in your best interest to outsource it. Do it yourself first. Figure out the tiny details and draft a standard operating procedure. Doing so allows you to monitor the outsourcing and determine very quickly what’s working and what’s not.